(1) Conduct an Information Awareness and Capacity-building Workshop at the CBCF’s Annual Legislative Conference (ALC) focused on establishing/building collaborations between HBCU researchers, administrators, and a cross-section of stakeholders, and to increase awareness of NSF’s programs and funding opportunities. (2) Convene a Research Forum that will elevate and translate research led by HBCUs in a setting that strategically positions it to advance STEM action and practice. (3) Prepare an outline of an Action Plan to inform QEM’s development of a HBCU Research Community of Practice to cultivate relationships so that HBCU researchers, administrators, and STEM stakeholders and practitioners will develop collaborations to advance STEM research at HBCUs and increase their institutional capacities in STEM. The QEM HBCU RAP Symposium will help to fortify the strengths and opportunities that HBCUs have by disseminating “what works” in developing a research enterprise through collaborative and strategic partnerships. The QEM ALC HBCU RAP Symposium sessions will elevate research and enhance institutional partnerships to advance STEM, and build collaborations with stakeholders, giving researchers at HBCUs greater leverage to contribute to national efforts. 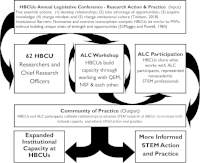 An expected outcome of the Symposium activities is an outline for a research-action-practice action plan that will share what works in building a community of practice between HBCU researchers and STEM stakeholders and other practitioners.